I’ve had the good fortune to visit the beautiful islands of Tahiti numerous times and as a travel agent specializing in the South Pacific I am frequently asked to choose the best hotels and resorts on Bora Bora. So which is the best resort, the five star St Regis Bora Bora or equally luxurious Four Seasons Bora Bora? How does the Hilton Bora Bora Nui or Intercontinental Thalasso compare for a romantic Tahiti honeymoon? And why might I select the newly remodeled Le Meridien Bora Bora resort or suggest a beach bungalow rather than overwater bungalow at the Bora Bora Pearl for a luxury Tahiti vacation? When we talk about Bora Bora we are talking about one of the most beautiful places in the world and Tahiti is a once in a lifetime “bucket list” vacation for most visitors. This often translates to the ultimate splurge and the hotels and resorts in Bora Bora have knocked themselves out trying to provide the best of everything. So how do you choose the best resort in Bora Bora for your honeymoon vacation? We start with location. It’s no coincidence that the most expensive and extravagant resorts in Bora Bora are on low lying outer islands called motus. Nor that the most affordable vacation packages are for hotels and resorts on the main volcanic island of Bora Bora. 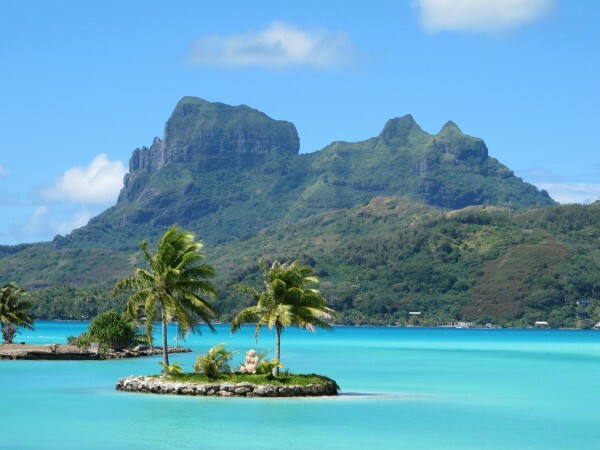 That’s because everyone’s dream of Bora Bora begins with an image of a shimmering turquoise lagoon surrounding an emerald green island with a mystical jagged mountaintop in its midst. So these resorts make my first cut for “best resort in Bora Bora”. Now on to the elimination rounds! What is the next most important feature for a fabulous and memorable Bora Bora honeymoon? Is it an overwater bungalow, gourmet dining, luxurious spa, enough privacy to skinny dip, snorkeling, overall WOW factor or (heaven forbid) is cost or budget a factor? Here’s where it gets interesting and very personal. All five resorts listed above would have my vote for “best resort in Bora Bora” based on certain criteria. Having seen the resorts, stayed in numerous overwater bungalows, enjoyed gourmet dining with no thought to cost, drunk champagne in a private pool overlooking Mt Otemanu, snorkeled with the sharks and rays, indulged myself in the luxurious spas, dined with table and chairs in the turquoise lagoon and rubbed shoulders with the rich and famous, I am admittedly spoiled. I am also in the unique position to help you choose the best resort in Bora Bora for your dream vacation or honeymoon. So take advantage! I guarantee the lowest price on all Tahiti and Fiji Island vacation packages and add no fees for my service. So call or email and get personalized service from a Tahiti expert and check in again for blog posts on individual hotels and resorts. I’ll be writing about Four Seasons Bora Bora, St Regis, Intercontinental Thalasso, Le Meridien, the Bora Bora Pearl and more! I’ll also be updating my ratings and reviews of the best Sandals Resorts including the latest on overwater bungalows at Sandals Grande St Lucian, the new golf course at Sandals Whitehouse, developments at Sandals Emerald Bay and the latest on Sandals Royal Plantation. Check back soon if an all inclusive vacation is right for you! The Solluna resort is checked in main 5 star luxury resorts in Corbett and is outfitted with top of the line rich offices and settlement to suit everybody's taste be it peace seekers or business voyagers.